These years were the last of the "good old days" when a kid could get actual experience on the railroad and be encouraged and accommodated by the employees who appreciated their jobs. When I was at the ceremony for the new Islip station, this superintendent actually introduced me to other LIRR officials noting that "we're letting Brad sell tickets at Amityville." The arrival of the MTA ended an era. This "part time" work continued off and on through 1964, depending on school schedules, etc. After graduating high school in 1965, I was officially hired-on as an extra ticket clerk and worked summers and winter vacations while attending Temple University in Philadelphia through 1969. After graduating in 1969, I returned to full-time work on the LIRR, eventually taking military leave through early 1973. In September 1973 I submitted my resignation and went off to pursue a career in accounting and business in which I continue to this day. I went out there in July or August of 1972 (I have the dater-die stamp in my diary and will have to check the exact date) and met the regular man there. He was quite a creep. We sold tickets until my hand felt numb from smacking the dater die so many times. As I used up ticket stock and needed replenishing, he'd hand me the next batch of tickets to use. At the end of the day we balanced our cash drawers, locked up our ticket cases and left for the day. I then went on my merry way being extra man elsewhere when I heard that the auditors paid the guy at Syosset a visit (they must've had a clue that something fishy was going on there) and when they finished, the Clerk-in-Charge was taken out in chains for stealing from the railroad. As Brad mentioned, you can only "juggle" ticket numbers out of sequence or out of order SO LONG before someone does a proper accounting and catches you out! What this guy was looking at was a short-time scam, but it would have NEVER lasted beyond the next audit. The criminal mind is usually quite small, and can't look far-enough ahead to implications that are sure to follow. I worked the LIRR Information booth at PENN Station, NY several times between June-September, 1972, each time with veteran Tommy Johnston, who worked the info booth as the regular clerk. If I recall correctly (it's been too many years) it was a two-man booth. The guy in the photo (not Tommy Johnston) is facing the track signs. That was the position held by Tommy. I would have sat directly across from him on the other side of the booth, facing the Nedick's lunch counter and public restrooms. The info booth was a fishbowl and it was HOT and stuffy and you had to wear a white shirt and tie. 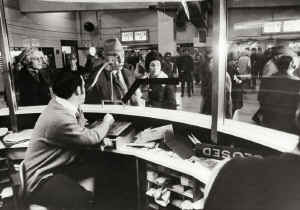 The photo was shot during the winter as the clerk is wearing a sweater and everyone in the station is wearing a coat. I had several Monday-morning assignments similar to what Dave describes (Merrick pops into mind immediately as the Merrick-Bay Shore-Patchogue relief job was my first "official" assignment). I never liked being handed a pile of tickets vs. having a ticket "case" of my own. I always checked every serial number of the batch I was given to ensure I would have a "clean" close at the end of the shift. Sometimes, the tickets I was given were already dater-stamped as the station had only one die. I never used an extra service die; every station I worked had either just the one die or a #2 (or whatever) die. I think the extra service dies went out of favor after the Hills daters were discontinued. Dave, did you ever see extra service dies?